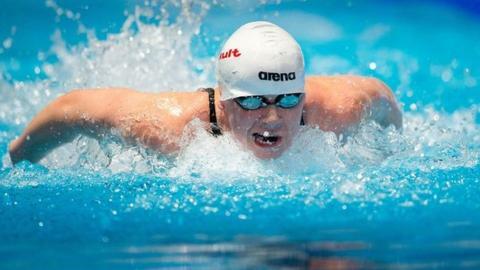 Sycerika McMahon has become the first swimmer from Northern Ireland to achieve the nomination time for this summer's Commonwealth Games in Glasgow. The Portaferry teenager swam 2:30:86 in the heats of the 200m breaststroke at the Canadian National Championships in Victoria on Wednesday. Her time was well inside the nomination time of 2:32.60. McMahon went on to swim in the 'B' final and was second behind her Irish team-mate Fiona Doyle in 2:30.98. Swimmers from overseas are not allowed to progress to compete in the 'A' finals at the championships at the University of Calgary. Doyle swam a time of 2:29.86 in the 'B' final and she and McMahon have both made the qualification standard for the European Championships in berlin in August. McMahon will take part in a number of other events over the coming days, including the 100m breaststroke later on Thursday. The qualifying period for the Commonwealth Games ends on 30 April, after the Irish National Championships in Dublin.